Nora Ellsworth, darling of London society, has her choice of eligible suitors, but since childhood, she has been expected to marry Jonathan Browning, a gentleman whose wealth and stability will someday secure the futures of Nora and her mother and sister. The family estate will pass to an odious male cousin upon the death of Nora’s father, and when he suddenly takes ill, her need to marry well becomes vitally important. As Nora struggles with the idea of marrying without love, she finds herself increasingly drawn to Devlin Fausett, a man with dark eyes and intriguing conversation. But Devlin’s reputation as an indebted gambler is difficult to ignore. Despite the rumors from the ton and the marriage decision before her, Nora is determined to befriend the dashing Mr. Fausett, and his charms soon make it all but impossible to remember her duty. Until she learns the truth of her fortune. There is a way to keep her family’s estate, but the price is high: Nora must wed, as soon as possible. Torn between two very different men, she must make the ultimate decision. Will she be guided by her head or her heart? A Tangled Inheritance is a very enjoyable story. It is well-written with great characters, and has just the right amount of intrigue with the scheming relations. The romance is sweet. I felt that the message of the book was about trying to be true to oneself, especially while dealing with familial pressures. For some reason the use of the word addiction throughout the story seemed too modern. I wondered if there was another term they would have used. But the inclusion of a gambling addiction by the main character seemed unique for this genre, and I enjoyed reading about Devlin finding something he wanted more than gambling. 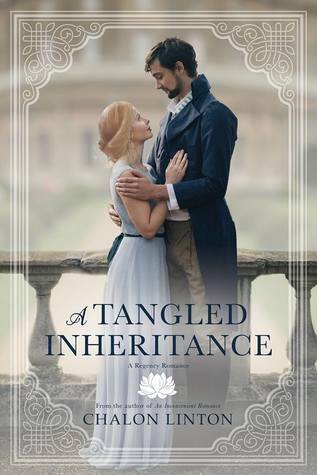 If you are looking for a clean Regency romance, that's also a fast read, I recommend A Tangled Inheritance. I'm looking forward to reading more from this author. What a fun enjoyable read. It moved along well, and even though I didn't get the chance to read it as fast as I would have liked (kids and chores kept calling my name and needing things...rude, right?) it is a quick read. I think my favorite thing about this book was Nora. She's just a great character. I enjoyed her loyalty and her friendship. I enjoyed her determination to not be bullied and to do it all with grace. The thing I disliked most was the gambling aspect. I just kept thinking about how that could/can really ruin a marriage, and I'm not sure it was completely flushed out in the end. I can't say more without spoilers, but it was kind of a hang up for me. Devlin is a great character though. The guy on the cover has a beard, and I did not picture him with one, but honestly, I never do even if it says they have one. Random, but there it is. I will look forward to more from this author. First off, I wasn't a fan of the first-person narrative and how it switched from Nora to Devlin each chapter. It was a bit distracting at first. Thankfully, the story is really good, so it didn't take more than a few chapters to get over that. Nora has such a good heart, and could see the good in others despite challenges they had, such as Devlin's gambling addiction. I liked how Nora was able to stand up for herself, even under extreme pressure from her parents and the Brownings. Devlin was considered a lost cause by so many, including himself, but when he met Nora, he found a reason to try harder and live up to his potential. I like how the story was realistic in that Devlin wasn't able to immediately kick his addiction. He tried, failed, and tried again. I was able to figure out who the bad guy was pretty quickly, as well as what the issue was with her father, but that didn't detract from my enjoyment of the story at all. I recommend this story and look forward to reading more from this author. Romance is in the Air – $25 Finale Giveaway!